Parliament today paid tributes to freedom fighters on the occasion of the 63rd anniversary of the Quit India Movement and also paid homage to the victims of the atomic bomb attack on the Japanese cities of Hiroshima and Nagasaki. A two-member Election Commission team will review the poll preparations in the state tomorrow to ascertain how far the state administration had carried out its directive to ensure free and fair poll later this year. Maharashtra Governor S. M. Krishna has given his assent to the Bill banning dance bars across Maharashtra. Raj Bhavan officials confirmed that the bill was sent to Mr Krishna today and the Governor gave his assent to the Bill shortly afterwards. Matanhy Saldanha, the lone legislator of the United Goans’ Democratic Party was today disqualified under the anti-defection law for voting in support of former Chief Minister Manohar Parrikar last February in violation of the party whip. Clearing the decks for bringing back underworld don Abu Salem’s girlfriend Monica Bedi, the Portuguese High Court has passed an order allowing her extradition to India, CBI sources said here today. Thousands evacuated after heavy rains lashed Krishna district of Andhra Pradesh. Conjoined twin sisters seek help for surgery. Mangal Pandey - The Rising all set to hit the theatres. “Those who have been named by the Nanavati Commission, those who have been accused by it should resign from the Council of Ministers,” Mr Vajpayee told reporters here. Asked about the NDA’s decision to demand Manmohan Singh’s resignation on the issue, the former Prime Minister said “as the Prime Minister, he is also responsible”. Meanwhile, the opposition NDA decided to stall proceedings in both Houses of Parliament and demanded the resignation of Prime Minister Manmohan Singh and Union Minister Jagdish Tytler. “We have decided to disrupt proceedings in both Houses and vociferously demand the resignation of the Prime Minister for trying to brush under the carpet the findings of the commission by approving the Action Taken Report and that of Tytler for his indictment by the commission,” BJP Parliamentary party spokesman Vijay Kumar Malhotra told mediapersons after the half-an-hour long meeting. The meeting, chaired by Mr Vajpayee, was attended by senior leaders, including NDA convenor George Fernandes, Mr S.S. Dhindsa, Mr B.K. Tripathy, Mr Prabhunath Singh, Mrs Sushma Swaraj and Mr Malhotra. Mr Malhotra said they had decided to give an adjournment motion on the issue, hoping that Speaker Somnath Chatterjee would accept it, failing which they would not allow both the Houses to function tomorrow also. “The Congress has betrayed the nation twice. First, by its involvement in the 1984 riots and secondly, by seeking to cover up the findings of the Nanavati Commission,” Mr Malhotra said. Earlier, addressing the weekly BJP Parliamentary Party meeting, Mr Advani expressed satisfaction that the Opposition had been able to put the Congress-led UPA Government in the dock, first on the issue of IMDT, followed by the Maharashtra floods, the blockade in Manipur and now the Nanavati Commission report. “We not only have great respect for the great lineage of the Sikh Gurus but bow to them all for their invaluable contribution to the Bharatiya culture and spiritual tradition,” Mr Singhal observed in a communication to NCM Chairperson Tarlochan Singh yesterday. Mr Tarlochan Singh said Mr Singhal’s clarification and assertion that the VHP recognises the Sikh community as a distinct religious identity has put to rest the controversy whipped up by certain public pronouncements made at a VHP conclave in Amritsar recently. The report clearly indicated that law enforcers turned a blind eye when mobs were led by politicians to attack Sikhs in 1984 in the wake of assassination of then Prime Minister Indira Gandhi by her security personnel. The annexure of the Nanavati Commission report, which was tabled in Parliament, indicate that criminal cases were filed against only 22 police officials and trial is still pending against five persons. Interestingly, cases against 14 police officials could not be proceeded with as “files were untraced.” Besides these, in cases against two officers ‘no chargesheet (was) filed’ due to lack of evidence. Five others were ‘acquitted’. Against one ‘no evidence’ was reported. While the list of the ‘accused’ included two Assistant Commissioners of Police, the name of five Station House Officers (SHO) are also in it against whom criminal cases were made, according to the Nanavati Commission report. Among others named in the ‘list’ are four Sub-Inspectors, five Assistant Sub-Inspectors, one Head Constable and five Constables. This is quite revealing as the government has taken the plea in the Action Taken Report that “there are legal difficulties in initiating any departmental proceedings” against police officials at this point of time. In the Capital, a total of 587 criminal cases were registered and files could not be traced for as many as 241 cases clearly indicating the intent and manner in which the police was carrying out the investigations into the cases. “There is ample material to show that no proper investigation was done by the police even in those cases which were registered by them,” Justice G.T. Nanavati observed in the report. “Even while taking their statements the police had told them not to mention names of the assailants and only speak about losses caused to them. There is also material to show that the police did not note down the names of some of the assailants who were influential,” the report said. The Nanavati Commission had blamed the police of remaining passive and said it “refrained from protecting’’ the people, while asserting that had timely action been taken several lives could have been saved. “The attitude of the police force was callous...,” said the Commission. In its report the commission held the then police Commissioner S.C. Tandon responsible for “what was going on in Delhi during those days’’ and ‘indicted’ him for his failure to take prompt and effective action. “There was a colossal failure in the maintenance of law and order and as the head of the police force he has to be held responsible for the failure,” it said in its report. He should have taken strict action against defaulting officers immediately and ought to have given directions to be more strict with the crowds, it added. Reacting on the government’s response, Abdul Hameed Naumani, secretary, Jamiat Ulma-E-Hind, said, “ Thousands of Muslims have been killed in riots during Congress regime in states and at the Centre, but after experiencing NDA regime and Gujarat riots, we have been expecting a better deal from the present government. Party’s Delhi unit chief Avtar Singh Hit told The Tribune that the party workers and riot widows and their children would march from the historic Bangla Sahib Gurdwara and make an attempt to `gherao’ Parliament. He said the fight against injustice would continue, as the Sikhs have not got justice for the past 21 years. “We have seen how the US government set a classic example of justice when it swiftly arrested a man who killed Balbir Singh Sodhi, a Sikh, in Arizona in a 9/11 reprisal attack. But what a huge shock it is that perpetrators of the 1984 carnage against the Sikhs in India are moving free for the past 21 years,” Avtar Singh said. He said the party president Parkash Singh Badal has convened the meeting of SAD Executive on August 13 in Chandigarh to discuss the Nanavati Commission Report and to formulate future strategy to tackle the issue, including the kinds of agitations to be adopted in the coming days. The Akali leader, accompanied by his party colleague Onkar Singh Thapar and SGPC member Kuldip Singh Bhogal, also slammed the Congress-led government for what he called remaining non-committal about action against retired police officials indicted by the commission. “Natural justice requires that all those who abetted this barbarism against humanity, whether retired or in service, must be punished if they are alive,” Mr Hit, a former president of the Delhi Sikh Gurdwara Management Committee (DSGMC), said. Meanwhile, Thapar led by a group of party workers and riot widows and a held a sit-in protest against the government ATR on Nanavati report on the Jail road in West Delhi. The protest resulted in disruption of traffic for several hours and the protestors burnt the effigy of Sajjan Kumar, HKL Bhagat and Jagdish Tytler. 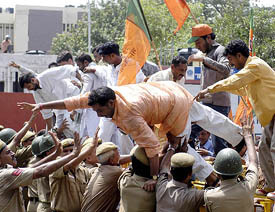 They also raised slogans against the Congress and demanded justice. “The commission has also thought it fit not to record any fresh findings with respect to those incidents,” the report said. He said several places like Kanpur, Ranchi, Bokaro, Bhillai, Meerut, and other cities in Uttar Pradesh and Madhya Pradesh witnessed riots. Interestingly, of the 2557 affidavits filed, 1041 affidavits had been filed by persons living outside Delhi, which is a clear indication that many riot victims were seeking justice from the commission. According to official figures, in the three-day anti-Sikh riots across the country 2733 persons were killed in Delhi, 127 in Kanpur, Uttar Pradesh and 78 in Bokaro, Jharkhand. Perhaps, another reason for the lack of observation by the Nanavati Commission was its decision to permit the Delhi Sikh Gurdwara Prabhandhak Committee, November `84 Carnage Justice Committee and the Shiromani Akali Dal (Badal) to appear before the commission as representative bodies of the riot victims. Others who had applied for allowing them to partipate on behalf of the riot victims were directed to submit their evidence and suggestions through those three organisations. Many applications were filed before the commission. Some of them were for allowing the applicants to participate in the inquiry. They were disposed off by directing the applicants to submit their evidence and suggestions through these three organisations. The commission said most of the applicants filed by persons from outside Delhi are for claiming more compensation and for paying compensation to them on uniform basis. The Action Taken Report said the Commission has recommended that uniform compensation across the country and the government would advice the state governments concerned to ensure uniformity in compensation, other assistance to widows and their families. “We have orders from the authorities not to allow anybody to see him. Perhaps they are worried about his security in view of the reports about his role in the 1984 riots,” a security guard says. Security has been beefed up around the hospital and you need an entry pass - almost impossible to get— to see Mr Bhagat in this luxury hospital. You somehow reach the second floor of the hospital (room no 3253) where he is admitted in the semi-ICU ward since October 10, 2004. “The man, who once ruled the national Capital, is now awaiting his end. No one comes here anymore to see him except his family,” tells his personal servant, Raju Sharma, who has been with Mr Bhagat for the past over five years. “We know that some people have burnt an effigy of Mr Bhagat yesterday and some may come here as well,” he tells in a hushed tone. As he gains confidence, he takes you to Mr Bhagat’s room where three more patients are admitted. One is horrified to see that Mr Bhagat has now turned into a bundle of bones. “He cannot recognise or speak any more. He just responds to me occasionally and his son,” Raju tells stoically. “I do not know what he has done in life. People say ‘Sab karmo ka khal hai,’ (As you sow, so shall you reap). There was a time when people like Jagdish Tytler and Sajjan Kumar used to visit our home, but no one came here even once during the past eight months,” he says, adding that he was just doing his “duty” and had not visited his home in Nepal for the past two years. Significantly, Nanavati Commission has absolved Mr Bhagat “in view of his physical and mental condition,” for his role in the 1984 riots while taking note of credible material against him. “The CPM demands that the government act on the specific recommendations made by the commission to proceed against certain persons named and to probe the involvement of other whose culpability has been indicated by the Commission,” the Politburo in a statement said. Interestingly, both the Left parties did not name anyone. The CPI Central Secretariat said the action raken report by the government in Parliament was “thoroughly disappointing.” “The action taken report submitted by the government is in all respects unsatisfactory,” the CPI(M) said. Terming the report as “disappointing”, the CPI said it did not in any way assure justice to the victims of the 1984 massacre. “The Commission’s report is self contradictry in its conclusions as it does name and speak about the involvement of several Congress leaders in the events. “Wherever and against whomsoever the commission spoke of credible evidence, prosecution should be launched,” the CPI said, adding that the law should be allowed to take its course and no attempt be made to shield culpable people. The CPI also pointed out that the commission had criticised and indicted the role of several police officers, thereby exposing the partisan and communal tendencies which had “got ingrained in a section of our police force”. “It is not enough to say that these officers have now retired, for retirement does not absolve any person from the crime of dereliction of duty,” the Left party said. The Central Government should also draw proper lessons from the report and initiate the process for revamping the police force so that its credibility is restored, the party added. “The Quit India Movement was a watershed event in India’s struggle for freedom — it contributed towards achieving the cherished goal of the freedom of the country,” Lok Sabha Speaker Somnath Chatterjee said. On nuclear bombing of two Japanese cities on August six and nine, Mr Chatterjee said that “the day is a reminder of the importance of eliminating weapons of mass destruction to ensure perpetual peace among nations”. He said that efforts towards eliminating nuclear weapons “should be sincere, comprehensive and non-discriminatory”. “To ensure global peace, all countries must exercise restraint and adhere to the part of non-violence”, he said. In the Rajya Sabha, Chairman Bhairon Singh Shekhawat said that the entire country responded to the call of Mahatma Gandhi and participated in the Quit India Movement. While EC Adviser K.J. Rao has already left for Patna, Deputy Election Commissioner Ananth Kumar is leaving tomorrow. The team would also review the progress in issuing photo identity cards to the voters. During the three-day stay in the state, the team members would discuss with the civil and police officials poll preparations as well as the law and order situation, EC sources said. The EC had last week directed the EROs to delete the names of all those persons against whom NBWs could not be executed for more than six months. It had asked the state government to furnish to the Chief Electoral Officer by August 19 a complete list of persons giving the full details of their residential addresses, against whom the NBWs have remained unexecuted for more than six months. Concerned over the large number of unexecuted non-bailable warrants and low recovery of illegal arms and ammunition in poll-bound Bihar, the commission had earlier directed the state administration to step up efforts in this regard. The commission had already directed the authorities in the state to complete by September 15 the process of issuing photo identity cards, which have been made compulsory for the forthcoming poll. The Bill called the Mumbai Police (amendment) Bill, 2005, with specific clauses prohibiting the functioning of dance bars across Maharashtra will come into effect after the state government issues a formal notification in the next few days. Maharashtra’s Minister of State for Home Sitaram Mhetre told reporters in the state Assembly that the notification with the date of ban would be issued shortly. He subsequently confirmed to reporters that the ban would come into effect from August 15. Meanwhile, dance bar owners across the state are awaiting the government’s formal notification to challenge the ban in the courts. “We are ready to legally challenge the law as and when the notification is formally issued,” said Manjeet Sethi who heads the Fight for Rights of Bar Owners Association. According to him, the body would try to obtain a stay on the order in courts. The bar owners say the government is discriminating against them even as dance performances are allowed in clubs and star hotels. Bar owners also allege that mujra dance parties continue to be held across Maharashtra which are frequented even by the state’s politicians. The Bill banning dance bars in Maharashtra was passed by politicians cutting across party lines. MLAs of the Shiv Sena and the Bharatiya Janata Party voted with legislators of the ruling Congress and the NCP last month to shut down dance bars across the state. In all, nearly, 2,000 bars in the state will be shut down. Bar owners say some 75,000 girls would be rendered unemployed if the bars are shut. Disqualifying him, Speaker Fransisco Sardinha said the measure was being taken under Sections 2 (1) A and B of the 10th schedule of the constitution. The Speaker’s ruling came in response to a petition filed by Congress MLA Jitendra Deshprabhu who prayed for Saldanha’s disqualification. Citing an affidavit filed by the UGDP in March this year, Deshprabhu contended that Saldanha came within the ambit of the anti-defection law. The UGDP had stated that Saldanha, a minister in the BJP government led by Manohar Parrikar, had refused to vote against the BJP and support the Congress. Sardinha, who was elected pro-tem Speaker last March to facilitate present Chief Minister Pratapsinh Rane’s confidence vote, disqualified Saldanha from voting and thereby got the Congress leader elected by a single vote. In the order passed recently, the Portuguese High Court order has removed another hurdle in her extradition in a case relating to the forgery of passport in Bhopal, the sources said. The little-known bollywood actress could now approach the Supreme Court and then the Constitutional Court of Portugal challenging the extradition order, the sources said adding the agency would oppose any such move.